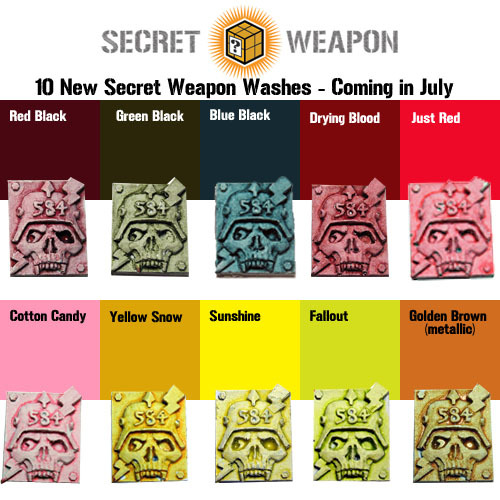 This time i want to tell you about the Secret Weapon Washes and the experience i've made using them. First of all i want to say thanks to Battlefield-Berlin again for making this review possible in its coverage. Okay, Baby Poop was hard to open but i won't tell you much more about this strange moment i enjoyed. As far as i know there are already some new ones coming from Secret Weapon. 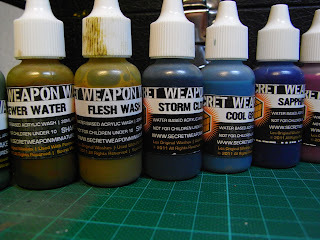 The mixture of the washes and its content were studied and mainly founded by Les Bursley from Awesome Paintjob and Secret Weapon is the retailer, if i got this thing right. Please correct me via comment as i am not really into the story behind the washes. Soft Body Black is a low pigment black wash designed to provide soft shading without distorting the colour of the model. Each bottle contains approx. 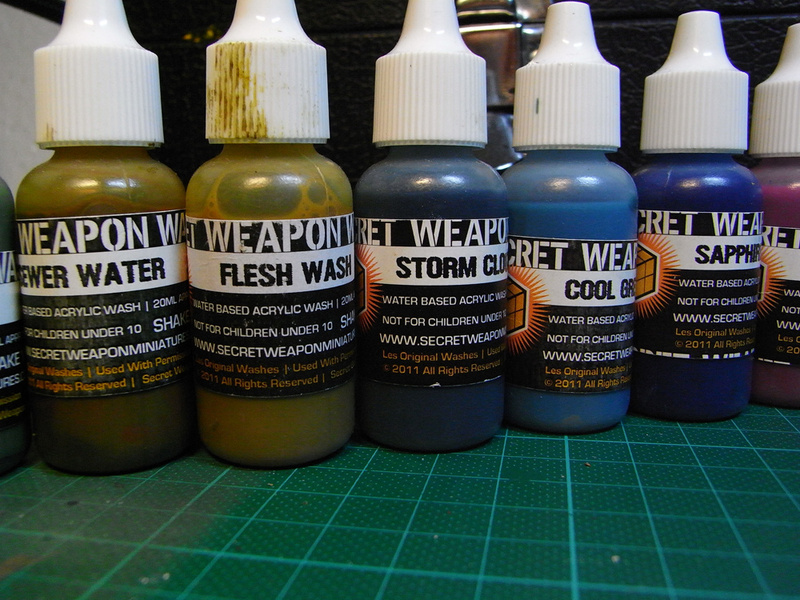 20ml of water-based matte acrylic wash. 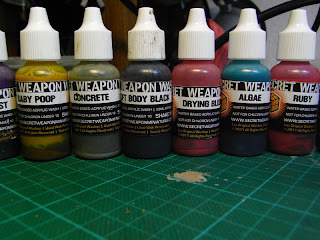 Ideally suited for one coat brush application and clog free airbrush usage. Heavy Body Black is a high pigment black wash, with 3x the pigment of the "Soft Body Black" wash, designed to provide maximum shading. Each bottle contains approx. 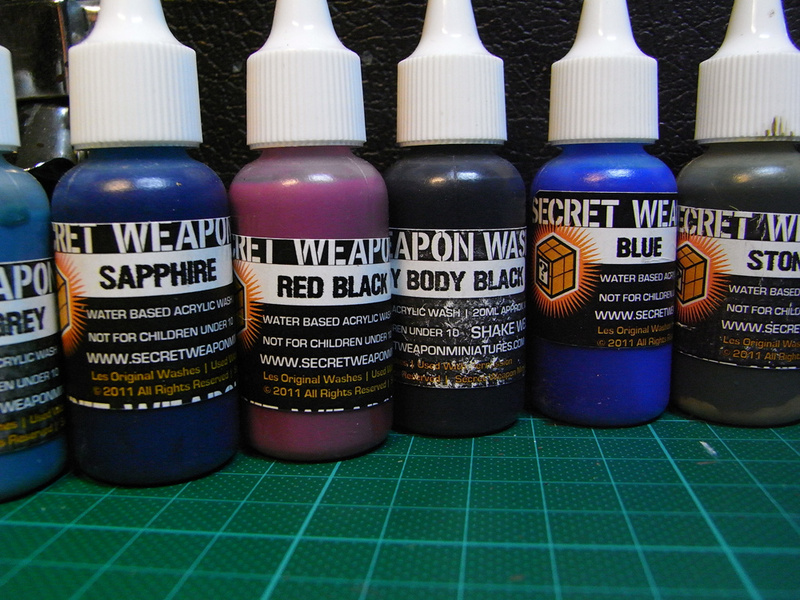 20ml of water-based matte acrylic wash. 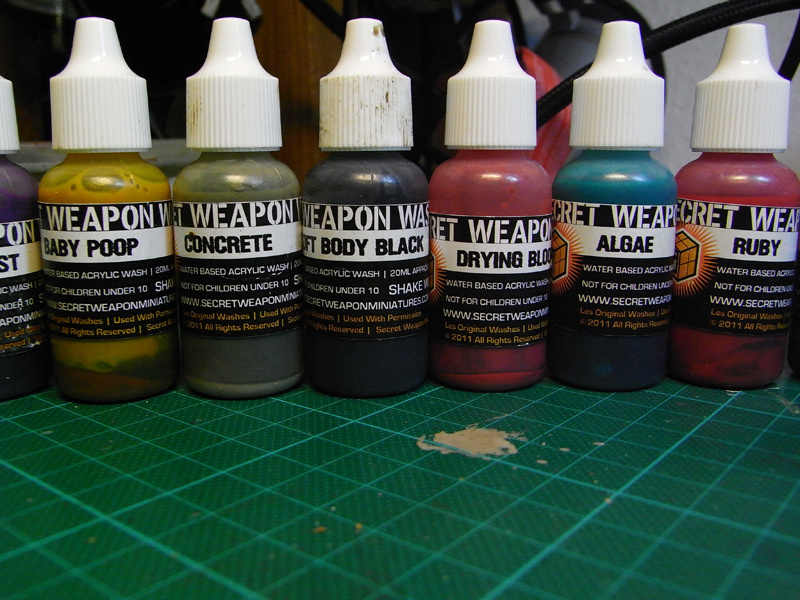 Ideally suited for one coat brush application and clog free airbrush usage. 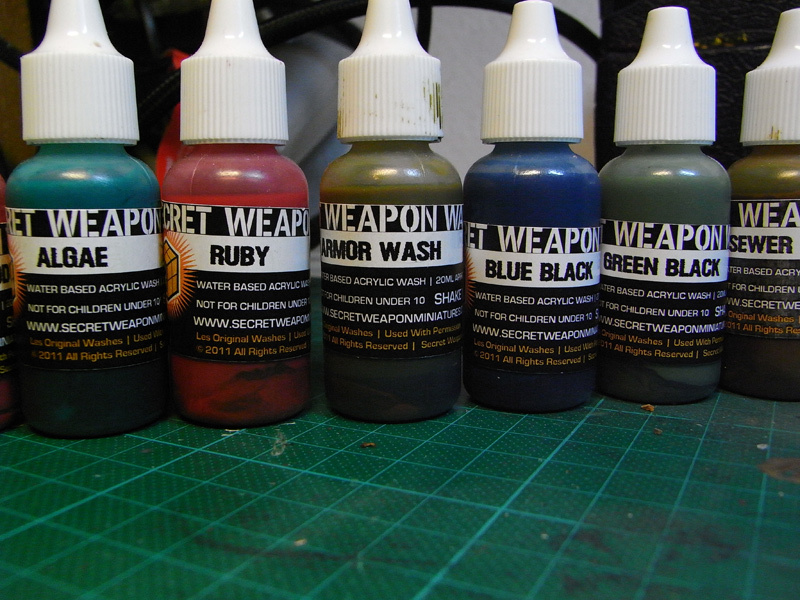 This is truely the magic behind these washes: to know what they are made for and to use them for the right areas. So it is not only buying and using the washes, it is also checking their options first. I took a moment to realize this and failed and errored with some washes as i was not satisfied with the result first - but that was my fault as i did not inform myself. Now coming to my experiences i've made. I got to say sorry that i don't introduce every wash i got, that would really burst the jungle volumes but i let you know with some words what i think. 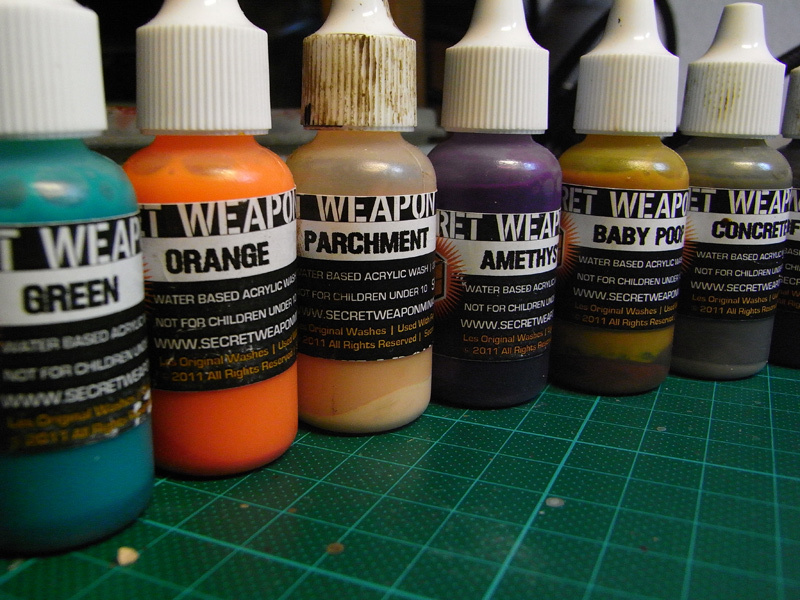 These Washes are a perfect match for every painter i would say. 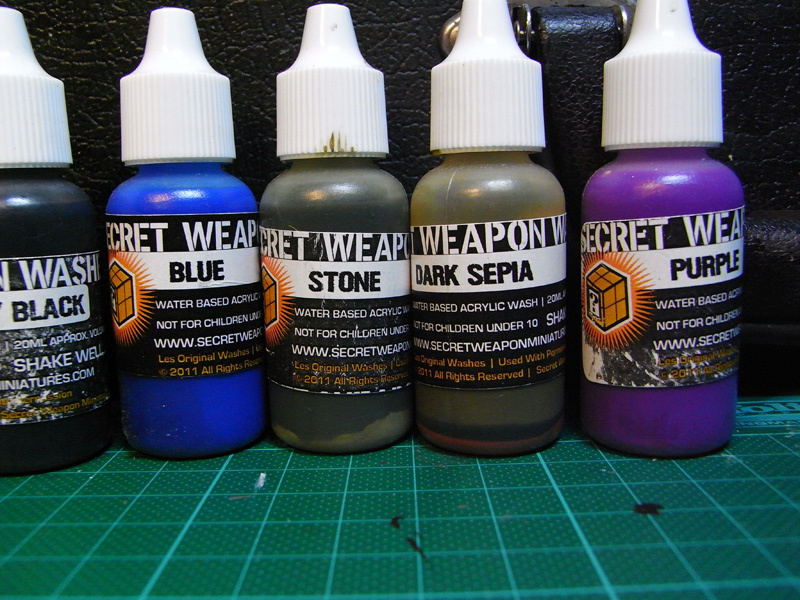 You really get a lot of ammunition in such a big color variety that you are not often need to mix your own colors. Whatever surface you got painted already - there will be a wash that fits. 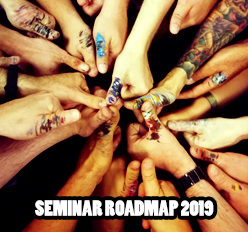 I really like to work with most of them, some left a shiny layer where i did not expect it, but that was my fault as not all of them are described as matte. So you can also work with the effects they create to get different textures, for example a soft shiny worn leather. A thing i did not really like was the shaking part, but mainly because i often am too lazy. Just kidding - you really got to shake them strong, mainly those high pigmented ones as after a while without using them the pigments will go down to the bottles bottom and you can't use the wash well. Les Brusley of Awesome Paint Job did do the original formulation of these washes. When he stopped making them and made the recipes public I got permission from him to make them under the Secret Weapon label. There are several SWM original recipes now in the mix but you'll find Les' name on every bottle. The review might have a little more weight to it if you showed us some work in progress that benefited from the washes. 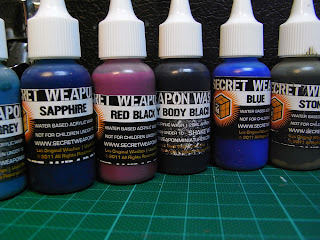 In addition, I think that with companies such as Vallejio and Games Workshop and Reaper all having their own washes, it might be useful to see a comparission between the various companies no? I have been using some of the select colours for a while and also got some very good results. Thanks for the Tutorial. Is there a trick to avoid the shiny look? They are were nice to use but I wasn´t able to dim the glossy shine down completely. Not even with multiple layers of matt varnish. What went wrong? To much water in the ink? Da mein Englisch nicht so der Renner ist - die Dinger glänzen teilweise wie Sau. Das geht auch nach mehreren Schichten Mattlack nicht weg. Zu Hülfe! @Anon: I'm not sure why you're getting shine on these. They're made with matte acrylic medium. Of course with any acrylic if you're applying it very thick you'll get some shine from the plastic.